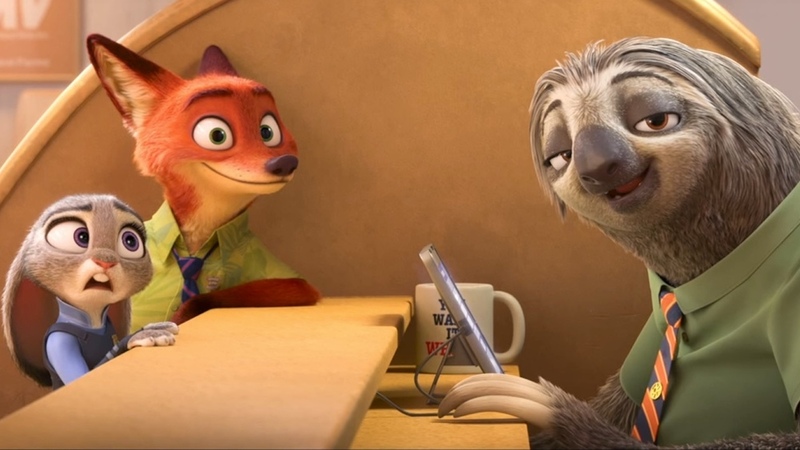 Earlier this week, I caught up with the #1 movie at the box office right now: ZOOTOPIA, the latest animated family feature from the Walt Disney Corporation. I had been initially dismissive of the film, having skipped an advance screening of it for a weird Neil Young double feature, but I heard that many critics were raving about it being a clever topical takedown of racial profiling so I just had to check it out. ZOOTOPIA takes place in a world with no humans, only animals, who were once savage but have evolved, and formed a civilization in which they walk upright, wear clothes, and work regular jobs. Ginnifer Goodwin voices our plucky protagonist, a rabbit named Judy Hopps, who dreams of being the first bunny police officer. Thanks to the city of Zootopia’s new Mammal Inclusion Initiative, she gets her chance but is assigned to parking ticket duty by the chief of police, who’s an intimidating buffalo voiced by Idris Elba. Because of a bias against foxes – we see her being bullied as a child by a fox in the opening sequence, and she carries “fox repellant” given to her by her parents – she follows one that looks suspicious to her into an ice cream store, but finds out it’s just a doting dad, named Nick Wilde (voiced by Jason Bateman) trying to buy a popsicle for his kid. When the elephant run establishment refuses service to Nick and his offspring, Officer Judy steps in and calls out the store’s unsanitary conditions, which include an elephant employee scooping ice cream with his bare trunk – heavens! The situation is resolved with Judy buying an elephant-sized popsicle for the thankful father and son. However, Judy soon finds out that she was hustled by Nick, who takes the huge popsicle and makes it into hundreds of tiny popsicles to sell to business suited rat population. Judy tries to arrest Nick, but finds that she can’t make any of the charges stick. Defeated yet still trying to prove her worth, Judy gets into a chase after a crook named Duke Weaselton (Alan Tudyk), inside the segmented city within a ciry, Little Rodentia. This gets Judy in trouble with the chief, but, via the surprise support of the Assistant Mayor Bellwether (Jenny Slate), it leads to the officer bunny getting put on a major case involving a series of missing animals. Turns out that Nick can help with a lead, and the duo hit the trail, which involves a cameo by Tommy Chong as a hippy yax who’s the “emotional life coach” at a naturalist commune, an arctic shrew crime boss named Mr. Big (Maurice Lamarche doing his best Marlon Brando), and, in one of the movie’s funniest scenes, the city’s DMV being run by sloths – get it? The well cast Bateman, at his cheeky best, and the equally Goodwin, giving it her all, play off each other well and do a lot towards making this the likable, yet appropriately apt, exercise that it is. It’s voice cast is energetically up to task throughout – though I could’ve done more with J.K. Simmons’ Leodore Lionheart, the lion mayor of Zootopia, and less with Shakira’s pop star gazelle (named Gazalle, of course), but I know they’ve got to work that teenybopper pop angle in order to sell some soundtracks (you just know that this one won’t push anywhere near as many units as FROZEN though). A delightful family film that actually has as much depth as it does heart, ZOOTOPIA is a really good sign for the future of Disney’s Animated Classics division. With hope, other lesser animation studios will take note and start to tackle real, relatable issues more in their movies. I’m looking at you, Dreamworks! BATMAN V SUPERMAN: DAWN OF JUSTICE: Yeah, No.